The efficiency and productivity of a well-designed industrial heat processing line depends on a safe, efficient, operator-friendly control system. Wellman Furnaces has the experience and expertise to assess the furnace system parameters together with customer requirements to deliver a state-of-the-art furnace control system to optimize performance and efficiency of every furnace or atmosphere product. Optimize and monitor power consumption, motor control, material conveyance, process temperature, gas or fluid flow, process pressure and much more with a Wellman Furnaces control system. 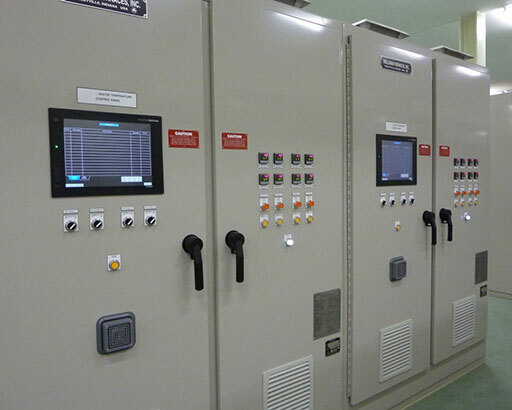 Wellman Furnaces control systems can incorporate customer-specified process controllers, programmable logic controllers, alarms, annunciation, messaging, indicators, recorders, data loggers, custom-designed operator interface terminals, touch-screen monitors and Ethernet communication. A well-designed Wellman Furnaces control system will complement any of our industrial furnace or atmosphere products resulting in a turnkey industrial heat processing solution for your heating application. Wellman Furnaces relies on documented design requirements, design reviews, product testing, customer training, and effective user documentation to achieve consistent customer satisfaction with every control system.